On May 12th, Allegra Pawlowski and I departed for Italy, arriving on the 13th. We picked up our Fiat Punto, hit the A-1, and just started driving south, following the signs for Naples, then Positano. If one felt the desire to stop in Naples, I would highly recommend they take in the Archeological museum, which holds so many of the treasures from the ancient cities of Pompei and Herculaneum. I of course also recommend a tour (guided) of these cities, which were frozen in time in 79 A.D.
We arrived to Positano, which was just as breathtaking as I remembered from my trip here 9 years ago. We checked into our hotel, Covo dei Saracini, our hotel for the next three nights, located at the very bottom end of town, directly on the beach. The rooms were lovely; bright and clean with great views. Each room has a/c, a terrace or balcony, satellite tv, safety deposit box, wet bar, and updated bathrooms. The roar of the ocean could be heard below, which was heavenly. After some rest, went out for a walk to rediscover this lovely town. I tested out one of the local specialties, lemon delicioso – this one in the form of gelato. Fantastic. Dinner later was at "Bacco dei Bucca", just a 5 minute walk to hotel and right on the beach – tasty food. Other restaurants we enjoyed were "Lido Azzurro Ristorante" in Amalfi – fabulous food. For a casual, fun ambiance, we like "le Tre Sorelle Ristorante" in Positano on the beach. I highly recommend a trip to Sorrento. Great city with lovely old architecture and gardens, and loads of restaurants and shops. Treat yourself to a beverage with view at the Grand Hotel Excelsior Vittoria. Villa BRV CRO – this 6 bedroom just a few kms from Amalfi was being completely redone when we were there, floor to ceiling, as it had a new owner. The furniture was still wrapped in plastic, the kitchen was compact with stainless appliances and everything you need, and the floors were all lovely Italian Vietri tiles (which come from Vietri, just a few villages away). The gardens and views were fantastic. Everything looked very fresh. 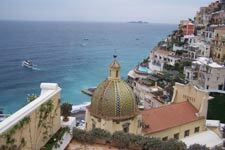 Villa HII GIU – 5 bedroom located in Positano, just below the Sirenuse hotel. This house is just lovely, tastefully filled with art and antiques. Old world charm overlooking the Duomo and beach. Villa BRV AZZ – this 4 bedroom (best as a 3 ) is a gem. It is located in Massa Lubrense and has the most incredible view of all, overlooking Capri, Ischia, and a promontory with Roman ruins. This house has spacious, sunny bedrooms, lovely outside terrace and large pool which you reach via a path through a secret garden. You can walk to village from here and it is a short drive to the old port. Well, it was hard for us to leave Positano, but we packed up, drove to Sorrento, and hopped on a fast ferry. These leave the port frequently and cost 16.50 euros each way, taking about 25 minutes to reach the island. 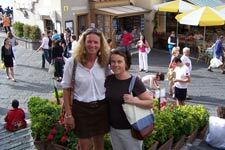 We took a cab way up to Ana-Capri, checked in to our guest house, which was located on the pedestrian walkway. We had distant views of the sea and were located just above a lemon grove. Dinner was at "Arcate" where I had a superb "Frutta del Mar" in a cozy local ambience. Prices here not bad at all.